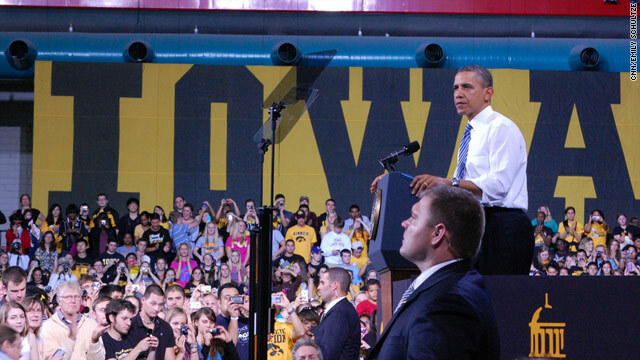 Iowa City, IA (CNN) - President Obama visited his third college in two days with this stop at the University of Iowa, where he continued his push for the youth vote, calling on Republicans to extend lower interest rates on federally subsidized Stafford loans. The rates are set to jump from 3.4% to 6.8% if Congress doesn't act by July 1. Pushing his campaign message that he is the candidate fighting for the middle class, Obama sought to contrast himself with his wealthier opponent, former Massachusetts governor Mitt Romney, telling a crowd of students, "We were lucky to land good jobs with a steady income but we only finished paying off our student loans about eight years ago." "Think about that," he said. "I'm president of the United States. It was only about eight years ago that we finished paying off our student loans." The president's trip to Iowa follows Tuesday's speeches at the University of North Carolina Chapel Hill and the University of Colorado at Boulder – all in battleground states. wow if only these republicans care the will immediately end the tax breaks for the rich & famous.. and the damn subsidies for these oil companies !!! Well, Obama is certainly no match for the charismatic Willard Romney and his singing of "America the Beautiful", but...it looks like they like him a little. OBAMA IS PITCHING HIS PROPAGANDA TO YOUNG, INEXPERIENCED, GULLIBLE, IMPRESSIONABLE MINDS. UNFORTUNATELY, MANY OF THESE KIDS ARE BUYING INTO HIS SELF-SERVING B.S..
OBAMA WILL WIN THE YOUTH VOTE WITHOUT EVEN TRYING SINCE THE REPUBLITARDS ARE MORE THAN WILLING TO THROW THEM UNDER THE BUS. NOT EVEN THE GOLD MEDALIST OF FLIP FLOPPING CAN GET OUT OF THIS HOLE. YOU OBAMA STOOGES ARE SO STUPID ... AND, YOU CAN"T FIX STUPID. AMERICA IS FINALLY WAKING UP TO WHAT AN UN-AMERICAN, INEPT, SELF-SERVING, LYING SNAKE YOUR EMPTY SUIT PHONY MESSIAH IS ... IN NOVEMBER, YOU FOOLS WILL BE NEUTERED, WHICH WILL BE THE FIRST STEP TOWARDS RETURNING AMERICA TO ITS FORMER GREATNESS. GOOD RIDDANCE, TRAITORS. HOWARD, LISTEN TO YOUR DAD. TAKE YOUR MEDS NOW AND GO TO BED. It was a Dem congress (including Obama) that set these rates to expire in the first place so how can he blame somebody else? Only the kool-aid guzzlers believe him. OBAMA will now stop using working tax payer funds for "HIS" re-election??? LOL ! ! ! ! I SUPPOSE HE COULD JUST TAKE ONE OF THOSE MANY VACATIONS BUSH DID, OR SHOOT PEOPLE AND DEFENSELESS ANIMALS TO PASS THE TIME LIKE CHENEY DID BUT THE PRESIDENT WANTS TO TALK TO THE PEOPLE OF THE USA ABOUT ISSUES THAT MATTER TO THEM. YOU KNOW, BEING PRESIDENTIAL. Maybe go online and read" George W. Bush and The Permanent Campaign Trail (The Public Purpose Vol III) by Emily Jane Charnock. Then decide if you should post. How about reading: "My Pet Goat" to a room full of children in 2001 while on the campaign trail? Barack Obama will do and say anything to get re-elected, it is sad and disgusting. Did he talk about his failed policy, the struggling economy, the weak housing market, the lack of jobs these kids will be faced with, the out of control national debt and did he vilify the rich ? Did he talk about racial profiling, did he talk about his healthcare reform that very few want imposed on them ? Did he mention how much he has grown the government ? How can anyone really vote for this guy ? @Matt, the Affordable Care Act of 2010 removed the middle-man from student loans, making college a little more affordable for students, and ACA also allows students to remain on their parents Health insurance till they are 26. Furthermore, I suggest you see him talk with Jimmy Fallon about the student loan bill, it's an interesting to watch how he's able to connect with the crowd because people know he's been quite vocal on this issue, and he's fought for them in the past.